Whereas ion exchangers (mainly) bind charged molecules, neutral adsorbent resins can be used for the extraction and in some cases even for the separation of neutral, basic and acidic substances. This adsorption process often is performed with compounds which are dissolved in water or in a solution which does not contain too much of an organic solvent that might prohibit the interaction (van der Waals forces, hydrophobic, hydrophilic bridges) between adsorbent and adsorbate. Generally speaking, the larger the surface, the higher is the capacity. The polar resin SERDOLIT® PAD IV is a macroporous copolymerisate of acrylic ester and DVB. It is supplied with a particle size of 0.3 – 1.0 mm and has a pore size of approx. 20 nm and a specific surface of min. 250 m2/g. Unpolar resins bind organics from water, polar resins even from organic solvents. Unwanted substances (impurities, salts) are eluted with water, the enriched compound(s) with water mixable organic solvents. Their eluotropic forces are known from chromatographic experience. Acidic molecules are best eluted with basic eluents, basic molecules under acidic conditions. 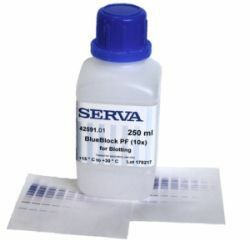 SERVA´s PAD resins are highly purified adsorbents which are prewetted (hydrophilized) and can be used straight away. These fine mesh resins may be used not only for solid phase extraction (SPE) but also in the well known reversed phase low and medium pressure chromatography up to 10 bars (140 psi) with the advantage to be hydrolytically stable within the entire pH range. Table 9 lists compounds which can be extracted from water resp. waste water with SERDOLIT® PAD resins.